With its Finest Curved Titanium Alloy shell making it highly-resistant to knocks, scratches, dust and damages. Provides Edge-to-Edge coverage for maximum screen protection. Laser-cut smart design and Anti-Chip Rounded Edge that gives maximum grip experience. Shock-proof with extreme durability. Oleophobic coating which guarantees your devices' smoothness and free from fingerprints and markings. Only 0.26mm thick, which is much thinner than the 0.3 mm thick that other sellers sale. This preserves the natural feel and sensitivity of your touchscreen device, leading to a more naturally feel while providing exactly the same strength and protection. 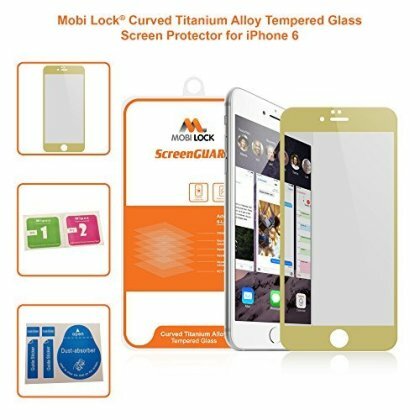 Advantages of Curved Titanium Alloy Screen Protectors: The Edge-to-Edge coverage is perfect to prevent your screen from being broken in case of mishandling. You get the same feel as if you did not have a screen protector on your device.